Francesco Marciuliano is the author of the New York Times bestseller I Could Pee on This, and Sally Forth, an internationally syndicated family comic strip (created by Greg Howard) that appears in nearly 800 newspapers around the world. He was also the head writer for the highly praised PBS children's series SeeMore's Playhouse. He lives in New York City. "This satirical take on a dog's easy, breezy existence makes for a fun-filled book that will make dog lovers smile from ear to ear." "You rolled your eyes every week that silly I Could Pee on This: And Other Poems by Cats book turned up on the best-seller lists yet again. 'Crazy cat people,' you said, with a barely audible touch of smugness. 'Francesco Marciuliano just doesn't have enough to do writing comic strip Sally Forth.' Well, now the Velcro bootie is on the other paw, isn't it? 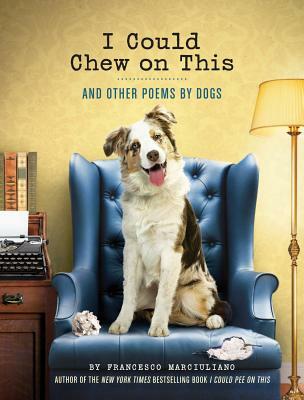 I Could Chew On This: And Other Poems By Dogs, by the same author, is out and you're just going to go belly up and do tricks for it, aren't you? This, after all, is real poetry."